Right now I`m sitting on the bus from Puerto Iguazu to Salta which has stopped for some reason. The bus hasn`t moved for about an hour, there are police scattered around and no traffic is going past. Perfect time to record the events of the past week. 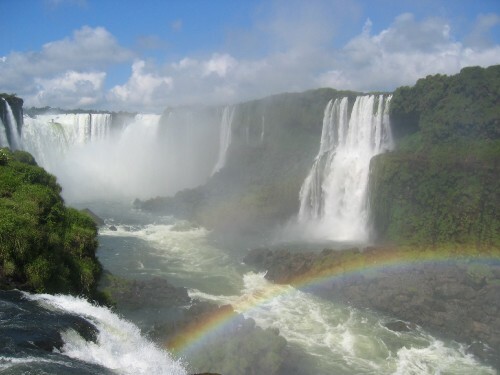 We left Buenos Aires on the evening of the 26th of feb on the 18 hour bus trip to Puerto Iguazu. Despite the length the trip was almost too easy, it has made me expect the same standard on my later trips. Travelling Super-Cama, first class, made the trip a breeze. Seats that could turn into fully flat beds, passable meals and beverages and sparkling wine for those who wanted it. Armed with these luxuries and a couple of good books the journey flew past and when we arrived in Puerto Iguazu I would have been quite happy to go a few more hours. The first thing I noticed about the town was how red it all was. The whole place was stained the colour of the dirt surrounding the town. It didn`t help that half the streets were little more than dirt tracks. After a few days there my shoes and jandals are stained the same earthy red colour which may take a while to come off. Our first night there was spent in STOP Hostel in the centre of town. I was drawn there by the promise of free international phone calls but when we arrived we saw that other than this there was not much going for it. After some discussion we moved a few kilometres up the road out of town to the more popular Hostel Inn for the next four nights. This place was clearly an improvement with more modern facilities, an inexpensive restaurant and a large pool. Our first couple of days there spent relaxing but the falls called to us. On the Monday morning we took an early trip across the border into Brazil to see the falls from that side first. Border formalities were quick and easy and we got to the park by about 9:30. Walking in we caught our first glimpse of the falls in the distance and I instantly decided that the trip to Iguazu was worth it. It was an awe inspiring sight. Massive torrents raged next to delicate sheets of falling water. Huge volumes of water crashed down the cliffs in every possible variation. The view from the distance was absolutely stunning and provided the opportunity for some great photos. As we got closer there was the opportunity to walk out on a catwalk close to the massive Gargenta del Diablo where spray from the falls saturated everyone and everything getting close. As it was a half day trip we had to leave after a couple of hours but happy in the knowledge we would see the other side the next day. In the afternoon we took a tour out of the town in the opposite direction to the falls. We were to go canopying (zip-lining) through the tree-tops of the Iguazu forest. On the trip out there we got the chance to see poor, rural Argentina. Small shacks, a rural school and fields of crops all surrounded by earthy red clay were a stark contrast to the wealth of parts of Buenos Aires. Even more so than the slums of that huge city. It was a bit of a shock to see the other extreme. I soon forgot about all of this (shallow person that I am) when we started on the canopying. We began on a platform high up in a massive forest giant. It was a fairly simple system. You held onto a handle that ran along a cable and you had to stop yourself before you plowed into the tree at the other end of the line. The first line was a 400m long thrill through the tree tops and the later ones equally awesome at least, the last was even better due to the extra slope on it. However this was quickly followed by disaster. As the truck was heading back into town I discovered my camera had gone. After a brief frantic search of my backpack I asked the driver stop. Our guide sent back one of the zip-line operators on a quad bike and after a few frantic minutes he returned holding my camera triumphantly above his head. Losing both my camera and my photos of the falls would have been a blow so was very grateful to have it back. The next day was the trip to the Argentine side of the falls and if anything this was even more spectacular than the Brazilian side. After experiencing some difficulties getting ourselves up we were away by 8:45 on a bus to the falls twenty or so kilometres away. We spent the entire day at the park leaving only when everyone is kicked out at 6pm. The experience was indescribable but I´ll give it a shot. We began by walking along the catwalks of the upper trail above many of the falls. This gave us views from the top looking down at the river below and over the edge of some of the impressive waterfalls and and of the lower trail at the base of the falls. As we moved down to the lower trail I felt a large buzzing next to my ear which was quickly followed by a painful sting. I never saw my attacker but it certainly sounded large. The sting was similar to that of a bee but it faded within the hour and the falls themselves were enough of a distraction to keep me going. The lower trail took us up to right underneath a giant sheet of falling water. This waterfall, while very impressive was actually one of the smaller ones. Here we were once again thoroughly saturated by the spray. Which in Iguazu´s tropical climate is not a bad thing at all. I followed this up with a boat trip under the falls. At the base of the lower trail there was a landing area. Nick and Pete balked at the cost but I figured I came this far, why not get that little bit closer. The boat ride was such an amazing rush. We went right up underneath two of the largest waterfalls. The air was so full of water we could not even breathe. And thanks to my awesome waterproof camera I have a video of the whole thing. So worth the extra cost I thought. After the lower trail we walked up and caught the park train to the immense Garganta del Diablo. The catwalk out above this behemoth of a waterfall was long, it took a solid fifteen minute walk to get out to the edge but when we got there, wow. A massive 82m drop that was shrouded in white mist and surrounded by billowing spray. Getting close to the top of the mighty cataract involved yet another soaking (my third of the day). Less than a couple of metres from the edge at times we stared over the edge into white nothing, glancing at times at the old catwalk that was swept away in by the flooded river in the early 90s. The final part of the day was spent walking along the quiet Macuco Trail to a small (by Iguazu standards) secluded waterfall. Along the way we saw a sprinkling of wildlife including a fast moving tree snake and so many large spiders in addition to the Coatis and Agoutis seen earlier in the day. At just over 3km long we walked through subtropical jungle for about 45 minutes before reaching the waterfall and the swimming hole it cascaded down into. Due to the park closure time of 6pm we only had time for a quick dip before heading back down the trail to the visitors centre at the entrance. We caught a bus back to the hostel and reflected on the awesomeness of the Iguazu experience. I´m already looking forward to coming back someday.